"What's It All About Alfie? ": Will Daniel Afredsson Stay or Go? 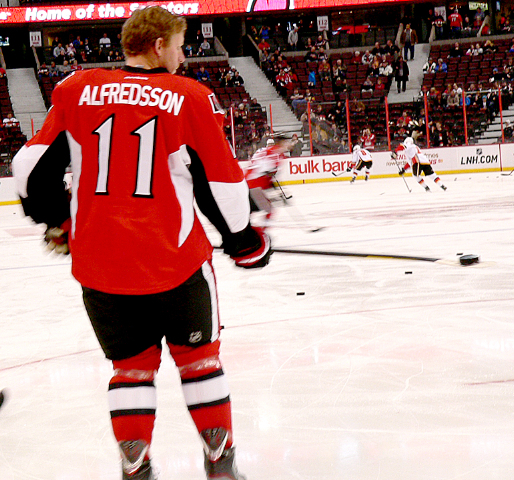 “What’s It All About Alfie?” Will Daniel Alfredsson Stay or Go? It is very difficult to put into words what Daniel Alfredsson has meant to the Ottawa Senators organization. From day one, there always seemed to be something special about him. From the first game when he skated on Civic Centre ice, to possibly his last in game 7 against the New York Rangers, he has been a true leader. Currently playing in the World Championships for Sweden, its hard to imagine the Senators without him. Opening night at the Scotia Bank Place without him would just feel wrong, if he decided to retire. There wasn’t too much hype surrounding the Swede at the time considering he was 21 years old when he was drafted back in ’94. That draft, Ottawa first choice was the 3rd pick overall , they took Radek Bonk. 100 picks later they decided on your current Sens captain with the 133rd overall pick. With three seasons under his belt for the Swedish elite team Vastra Frolunda HC , he didn’t really tear up the league scoring a total of 54 points in 82 games. He came over to the NHL with much praise, but still unproven. He changed that very quickly. Scoring 26 goals, and a total of 61 pts that season and won the Calder Trophy for rookie of the year. After being named to the NHL All Rookie Team, the thoughts of “the sophmore jinx” could swirled around, but Daniel never gave it a chance to be talked about. Turning in a 71 point camapign, and a second consecutive all star appearance. With a great start to his NHL career, and fan base that grew with every game, he could not keep away from the injury bug. The next 4 seasons he missed a minimum of 14 games each season, still putting up respectable numbers, but not nearly as high as he would have liked them. In the summer of ’99, then Senators captain Alexei Yashin packed his bags and went back to Russia over a contract dispute. Not exactly what a team needs in a captain, they decided to name Alfredsson the leader of the pack, but that didn’t go over to well at the start. Media ridiculed him, saying that he wasn’t captain material and that they should choose someone else. Coach Jacques Martin stuck to his guns and had that “C” sewed onto #11’s jersey. That was probably the best decision they could have made for the organization. The following season wasn’t an easy one for Daniel, still battling with the IR, but proved that in 57 games that he can still be a force, notching 59 points which was good for 2nd overall on the team. From 2000-01 to 2003-04 his point total increased with each passing year, also reaching a career high 80 in 03-04. During the lockout(2004-05) he returned to his old stomping grounds, leading the Vastra Frolunda HC to a league championship, also recording a league record 12 goals in the playoffs, which has since been broken by current Sens prospect Jakob Silferberg. The NHL returned the next season, Alfie was healthy and ready to prove himself once again. He scored his career high 103 pts and was tied with linemate Dany Heatley for 4th overall in the league. The Sens lost in the semi finals against the Sabres in 5 games. 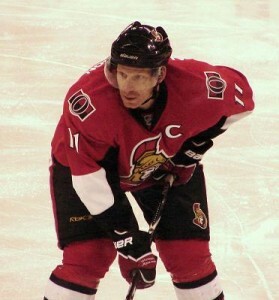 With the loss to the Sabres burning inside, Alfredsson came right back the next year and carried his team to their first and only Stanley Cup appearance in 2006-07 , he also just happened to scored the game winning goal in the Eastern Conference Final against the arch rival Buffalo Sabres in overtime of game 6. They fought to the end, but the end was game 5 against the Anaheim Ducks, and they were left watching guys like Pronger, Niedermayer and Getzlaf celebrate with Lord Stanley. Since that run, the team has made the playoffs 3 of 5 years and each time bumped out in the first round. At 39 years old, Alfie still has gas left in the tank, scoring 27 goals and 59 pts this past season. Problem is that he also suffered 2 concussions, both while playing against the Rangers. One in the regular season by a total cheap shot by Wojtek Wolski, the other by Carl Hagelin in the playoffs. With 4 young boys, Hugo, Loui, Fenix and William Erik and his wife Brigitta, Daniel has a lot to think about after the World Championships are over. He can still play at an elite level, top 6 on majority of the teams in the NHL but does the recent concussions put a cloud over a return ? It’s really hard to tell which way he leaning towards right now, but one thing is for sure, no matter what he chooses to do, you know that it’s going to be the right decision. All I know is that when opening night comes around at Scotiabank Place next season, and the game clock hits 11:00, regardless of the choice that Alfredsson makes, the crowd will be chanting ALFIE, ALFIE, ALFIE.